A new order is taking shape in Europe. Let’s call it the Berlin-Washington order to harken back to past examples: Vienna, Versailles-Washington and Yalta-Potsdam. This model is the result of the regional development of the Westphalia system and has some key defining features. It excludes and even antagonizes Russia. It is an organic part of the structure of the global West and plays a role in its confrontation with the global non-West. This confrontation is sometimes (with Russia) crude and straightforward and occasionally (with China) has a complex structure and takes economic interdependence into account. The new order aims to bolster the old West, or the Europe of the European Union. It is based on unity on several fronts: military and political (NATO), economic (the forthcoming Transatlantic Trade and Investment Partnership or some other incarnation), culture and civilization (liberal Protestantism) and even ethnic identity (the relative majority of the white US population has German ancestry). Even the most hapless future US president is extremely unlikely to block the emergence of this new order. It is guided by real facts and interests. And this order, like any other, is what Europe’s political and economic elites truly want, after hesitating in recent years. The new European order is defined by four major international and political processes. First, Europe no longer wants to try and incorporate Russia as a junior partner but instead seeks to revive its historical role as a rival and threat. Second, there is the deep crisis in the European integration project, which requires strong leadership to overcome. Third, there is the UK’s withdrawal from the EU, which is an opportunity for the union to overhaul its obsolete administrative and regulatory systems. And finally, Europe needs to find its place in the new system of relations within the collective West. This system is based on new mega-regional trade and economic associations that do not reject globalization but steer it to the benefit of the historical leaders of the process. One such association has already been formed –the Trans-Pacific Partnership (TPP). This free trade pact is so cleverly designed that even failed ratification would not stop it. For example, it could be put into effect via an improved mechanism of bilateral agreements on trade and investment. Another association, the Transatlantic Trade and Investment Partnership (TTIP), is likely to be set up in the next few years in spite of the obstacles of the last few months, which, some observers believe, could thwart the negotiations. The new Berlin-Washington order could be an effective response to the threat of chaos looming on the horizon for the EU. It will center around a strategic and comprehensive partnership of mutual respect between the Western economic giants – the US and Germany. NATO will become the military and political foundation for unity against Russia. The new system will put an end to the attempts to form a European security and defense identity. This identity was already forged during the dramatic events in Eastern Europe following the coup in Ukraine. However, instead of some amorphous common European security policy, NATO will provide the solid institutional basis of this identity. The US will continue to play the well-defined role of military and political leader of the West. The new order will reshape trade and economic relations in the Euro-Atlantic region. The common market of the EU will be an integral part of this new system of relations within the future TTIP along with the US, Canada and the UK. Brexit will dramatically alter the EU and Europe as a whole, with two overarching processes to follow. On the one hand, the EU will further consolidate its economic unity. On the other, integration of political and security systems will most likely be suspended. NATO will assume responsibility for the EU’s external security. Hopes for European defense structures have been abandoned. The US and the pro-US lobby in the EU have restored full control over the situation in the wake of the dramatic events of recent years in Eastern Europe. Brexit might accelerate negotiations on the future TTIP and increase homogeneity among the remaining EU members. Without the irritant of Britain, Germany will find it easier to persuade France and some opponents within Germany that only covert liberalization and reduced social obligations can save the European economy. The need to shake up the economy seems to be unanimously acknowledged by the elites in Berlin along with the idea that having successfully led Europe through the euro crisis, Germany must save it strategically and take it to a new development level, peacefully of course. 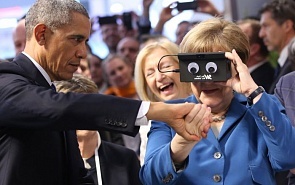 Approval of the TTIP project in Germany has dropped to 17 percent, while the latest round of negotiations between the European Commission and the US has brought no tangible results. But this does not mean that TTIP is fantasy. The project will be implemented in one form or another, though perhaps not as fast as enthusiasts in Brussels expected. Britain, in turn, will be able to negotiate the future format of its relations with the EU and also act as a third partner at the TTIP talks. TTIP might turn out to be the best format for London to maintain its presence in the common EU market, without the binding obligations Norway and Switzerland have to accept. Berlin, Paris and Brussels also understand that the UK will have to find its own unique status in relations with former partners. Therefore, Brexit might not stall but rather restart negotiations on TTIP (or whatever it will be called in the future). In this connection, negotiators in London, Brussels and Washington would have to assign priority to synchronizing negotiations on the new format of Britain-EU relations and the TTIP agreement. It is entirely possible that London is waiting to invoke Article 50 of the Lisbon Treaty to give itself time to prepare for talks toward this end. Even if TTIP only vaguely resembles the Trans-Pacific Partnership (TPP) agreement signed in autumn 2015, it will be exactly what the UK needs in its relations with the EU – access to the market and the free movement of capital. The issue of qualified workforce could be addressed in a separate format. The US in turn would be quite satisfied if its major ally retains its status and role in the Euro-Atlantic economy. This position will enable Britain to become a giant Singapore of the Atlantic – a hub for trade and investment flows – while regaining control over immigrant workers and their rights. The new Berlin-Washington international order will be a combination of a highly open market (always profitable for economic powerhouses) and sovereign nations reclaiming part of their political authority (which will allow the strong ones to address security issues independently of the weaker members). The need to fight terrorism will also encourage sovereign nations to reclaim some authority. The atrocities in Paris, Brussels and Nice are proof that terrorism is threatening to engulf Europe. As a result, Europe will abandon efforts to set up united European intelligence services, accelerating the push for greater control over national borders. Clearly, police and intelligence services in some countries will be more effective at combatting terrorism than in others, which is why reinstating border security would become crucial. The European elites will have to find a way to combine an open market and tighter security. As a result, we will have a relatively united Europe economically that is capable of uniting politically only on a limited set of issues – ones that will not undermine transatlantic solidarity, which, along with its institutional embodiment in NATO, will become the key determinant of Western civilization’s survival and the main tool in its struggle for global leadership. With the advent of the new order, the EU is unlikely to become a simpler and more responsible partner for Russia. Many observers have expressed concerns that it could even become more aggressive and go beyond political confrontation into military provocation. Dialogue on individual issues with the most sensible European nations will be possible, though not in violation of the tough rules of the Berlin-Washington system that is being forged in Europe. We should do our best to prevent a divide between our societies and the erosion of our common cultural and civilizational space. The EU, however, will never recognize Crimea as part of Russia and lift its barbaric sanctions against the peninsula. Russia in turn will have to pay more attention to developing its territories beyond the Urals and boosting ties with Asian economies. It could involve European companies in the process, if they are flexible enough under the pressure of sanctions. It would help if Russia, China, Kazakhstan and other regional partners moved forward with building a Eurasian transport and logistics system followed by a joint development area. It is equally important to prepare, together with our allies, to respond to future threats from the South and to boost cooperation between Moscow and Beijing in providing security in Central Asia. Russia will not be part of the new European order, which could make it relatively unstable and short-lived. This is what happened to another order, the Versailles-Washington model, which basically ignored Russia. Conversely, the international orders that treated Russia as an important part – Vienna and Yalta-Potsdam – turned out to be successful and ensured peace in Europe. Still, Russia and the Berlin-Washington order will be mutually essential external factors. Russia’s future lies in the broader, democratic formats of international cooperation. These formats have to be developed in Eurasia as part of a comprehensive Eurasian partnership. Only as part of this community will Russia have enough standing to deal with the new Berlin-Washington order. This community must be based on principles and rules Russia develops with its strategic partners and allies. There would be no place for us in a different setup.